There are lots of ways to install apps on your iPhone, iPod touch or iPad. You can install them from the App Store, as well as many other sources through Safari. When using methods of installing apps from Safari, they will often expire after a while, meaning you’ll have to reinstall them from somewhere else. For those of you that have a jailbroken device, you can get around this by installing any IPA file directly on your device. 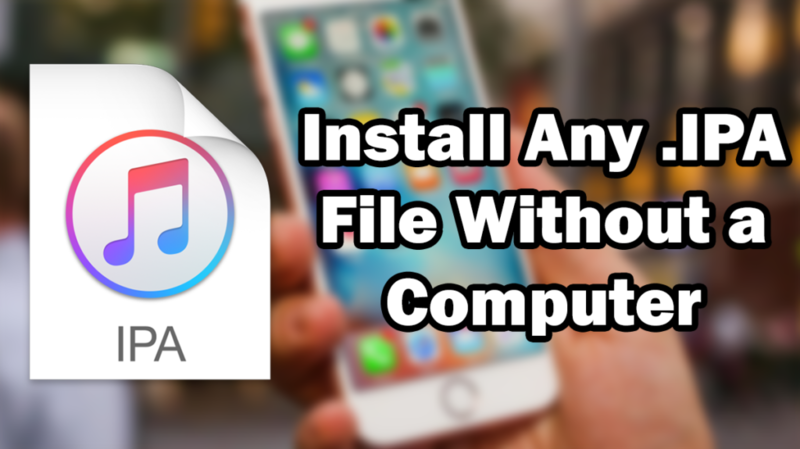 This guide will show you how to install IPA files without the need of a computer, as long as your device is jailbroken. If you don’t have a jailbroken iOS device, you can find the latest jailbreak guides available here. If you can’t find one for your specific iOS version, then I’m afraid you’re out of luck and will have to wait for a new jailbreak to be released. This requires your device to be jailbroken. Apps installed using this method will never expire or get revoked, as they do not rely on certificates. You do not need a computer in order to do this. Open the Cydia application on your jailbroken device, and tap on the ‘Sources‘ tab at the bottom. Tap the ‘Edit‘ button in the top right, followed by the ‘Add‘ button in the top left. A box should appear asking for a Cydia repo link. In the text box, type ‘cydia.angelxwind.net‘, then tap the ‘Add Source‘ button. Once the source has been added, tap on the source called ‘Karens Pineapple Repo‘. Tap on ‘All Packages‘, then find the one called ‘AppSync Unified‘. Once you open it, tap on the ‘Install‘ button in the top right, followed by the ‘Confirm‘ button. This will install AppSync. Once AppSync finishes installing, make sure to respring your device. When your device has finished respringing, open Safari and find a direct link to an app .IPA file you want to install. A good source of these is https://hollr2099.net/ipas.html. Tap and hold on the download link of the IPA file you want to install, and copy the link. Open a new tab in Safari and navigate to https://apexica.s0n1c.org/installer/. Paste the IPA file link you copied before into the ‘IPA URL‘ box. Type the name of the app you are installing in the ‘App Name‘ box (it can be anything you want). Once you have completed box text boxes, tap on the blue ‘Create‘ button. This should bring you to a page with a blue ‘Install‘ button. Tap on the ‘Install‘ button to start installing the app. A pop-up should appear asking if you want to install the app. Tap on the ‘Install‘ button to start the install. The app should now be installing on your home screen. Once the install is finished, you should be able to use the app as normal! It’s said that you should put username and password ?? !